The New Yorker ‘festival of ideas’, having now disinvited Steve Bannon, is facing his ire – despite the fact that he knows he’s won either way. Invited, he gets to peddle his half-truths and dog whistles; uninvited, and he’s the victim of PC culture. Minorities are overly-familiar with this game, and while we see through it, the media seem to keep falling at the first hurdle – which is differentiating between free speech and hate speech. Inciting genocide or a civil war is not a right. Everything said in the name of free speech is not free from repercussion. It’s not a magic phrase that when uttered instantly absolves the person of all responsibility.​ Steve Bannon, however, goes one further. He plays the master manipulator and the victim effortlessly. He cries about being denied his right to free speech while shouting from an incredibly large platform. And the media falls for it. Every. Single. Time. Steve Bannon doesn’t even have to work that hard because the news outlets do all the work for him. ​if we could trust those with power to hold him to account I could perhaps be compelled to see things differently​ but on the occasions where he has been invited on TV or radio he is never adequately challenged, leaving him to spout his nonsense with minimal intervention. His dog whistles are heard loud and clear by folk who were never going to change their mind anyway, yet we are force-fed this idea that fascists deserve to be heard so they can be put in their place (which is in the White House, apparently). We will undoubtedly see repercussions of his “bad politics” again when he appears at the Open Future festival run by The Economist with the blessing of the Editor-in-Chief. The reaction to Bannon being disinvited has been utterly predictable and embarrassing. Instead of giving him the Milo treatment, we’re meant to believe that he still has something worthwhile to say, therefore we must avoid driving him underground like the troll he is. All the minorities are suddenly invisible and we have white people being asked to discuss issues that don’t even affect them. It’s easy for them to claim that it’s only fair that good ole Steve gets to say his bit when they aren’t in the firing line. I say this while knowing full well that I could be invited on and elegantly explain why his presence is unnecessary but it would need to be amplified by a white voice for anyone to actually take it seriously. It’s a catch-22, but I’d still much rather prefer if white women like Ella Whelan didn’t get to use their time on TV to discuss bigotry as if it’s of the same urgency as not liking pineapple on pizza. The Steve Bannons of the world have always existed in one form or another, as have his less successful counterparts Jared Taylor and Richard Spencer – both of whom enjoy peddling the absurd myth that compared to white people most ethnic minorities are savages with inferior intellect, which has given even the dumbest of racists delusions of grandeur. As if systematic racism wasn’t enough fun, we’re also forced to listen to the tedious rhetoric of the many power-hungry fascists desperate to become the new Hitler in skinny jeans. None of this is far removed from the daily lives of people of colour. Everything filters down, from racist agitators through politicians and the media to harassers in the street, dirty looks in the pub and humiliating treatment by police and border officials, It’s why we have to prove ourselves to be overly competent for a job a white people can just walk into. ​It’s why you tend to only see one minority at a time on TV shows. Sure, Bannon and his cronies aren’t directly responsible for the fact that it took Friends nine seasons to feature an ethnic minority. But they are responsible for othering minorities to such an extent that we are dehumanised en masse. We don’t actually have to be exterminated or physically assaulted to be harmed by them; we just have to exist. It’s in the details. It’s in the hostile environment he encourages which places ordinary muslims under intense scrutiny. It’s in Brexit. It’s in the attempt to suppress black voters in the US ​through gerrymandering, voter ID laws and purges of voter rolls.​ It’s in the way that people compliment my mother on her excellent English despite the fact that she was born here. It’s when people consume and espouse the Daily Mail while buying it from my immigrant father. It’s when people ask me where I’m really, really from. It’s when my ability to speak another language is used to question my Britishness. It’s when the US can create a law and casually refer to it as the Muslim ban. Every time I and my clearly Muslim name travel to the US, my boarding card has the dreaded SSSS on it. This ominous sequence of letters is why I’m stopped and searched at every port of security for clearance. It’s why sniffer dogs nose through my colourful sun dresses and why I’m aggressively manhandled multiple times as the pat downs increase in their humiliation. I factor this into my holiday plans the way most people factor in sunscreen. Amongst a long list reminding me to pack an adaptor, I also calculate and set my alarm so I’m at the airport obscenely early so these extensive security checks don’t risk me missing my flight. Like Steve Bannon, I, too, thrive on attention. While he cries out for a race war, I mostly ask people not to send me racist death threats for informing them that “naan bread” means “bread bread” so saying naan alone will suffice. It’s controversial stuff. My existence and those like mine are constantly tainted by the influence of the alt right in a myriad of ways of which I am lucky to be at the milder end of. Regardless of the topic, like most women of colour, I can’t tweet, write an article or appear on TV without receiving racial abuse, whether that be someone taking umbrage with my skin tone, referring to me as a terrorist or accusing me of trying to implement Sharia law. In order to pursue my career, I have to accept racism fueled by the likes of Bannon as a consequence of my ambitions. It’s especially wild when you realise I’m just a young working class Muslim woman from a small town in Scotland who spends most of her time discussing pop culture and writing comedy. That’s the crux of the matter. Most minorities, including Muslims, are incredibly ordinary people busy binge watching Netflix. 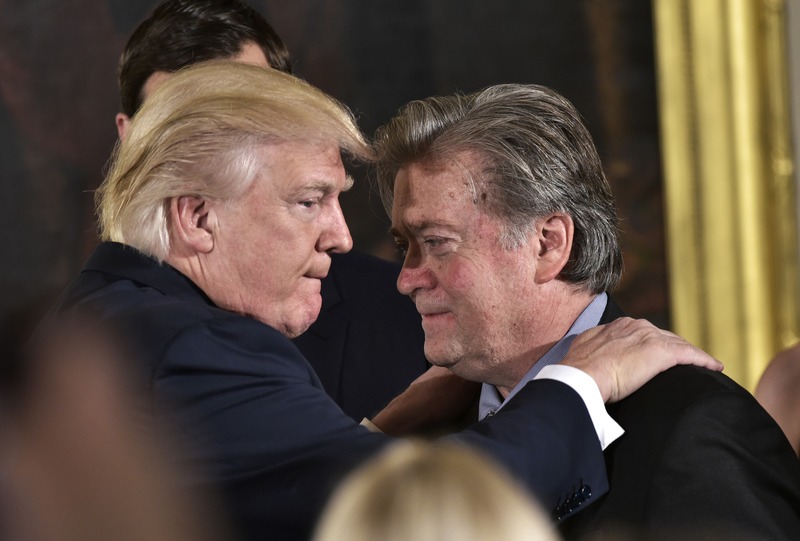 But Steve Bannon is set on turning the western world against us with the promise that we’re all secretly nefarious beings who need to be ousted from society – one we helped build and defend, no less. So yes, Steve Bannon is dangerous to me, and no, I don’t think his racism has a legitimate place in some healthy marketplace of ideas. Great article. Deconstructed him pefectly. When I saw the accompanying picture, the caption “Et tu, Bannie?” sprung to mind, perhaps that’s too senatorial, and indeed knife-crimey. If I might use an international football (soccer) analogy, I think it might be helpful if a high-profile “festival of ideas” would have a public qualifying stage, where larger numbers of hopefuls had to compete on equal terms and be tested not only on a few choice attacks but a gruelling trial of their defence. Would Bannon then risk being a soon-forgetton loser knocked out in an earlier round? As a Native New Yorker who was brutalized by the city as an adult and priced out of my hometown, and a onetime aspiring British/French expat (I nearly succeeded, but Theresa May’s Home Office thwarted me), I question the term ‘healthy marketplace of ideas’ as applied to something as pretentious celebrity-centric, and for-the-plutocrats-only as the New Yorker Festival. Surely a small town Scottish lass can relate to my scepticim?